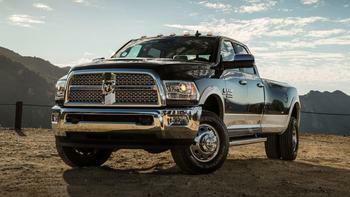 Chrysler (FCA US LLC) is recalling an estimated 573,876 heavy-duty trucks in the U.S.
A specific steering-linkage configuration on certain vehicles may separate over time, resulting in a loss of steering. The company says it is aware of one potentially related injury and eight potentially related accidents. The recall includes model-year 2013-2017 Ram 3500 pickups and model-year 2014-2017 Ram 2500 pickups and 3500 chassis cabs. In addition, an estimated 62,734 vehicles in Canada, 17,682 in Mexico and 5,837 in certain markets outside the NAFTA region may be recalled. Chrysler will notify owners when they may schedule service. Owners with questions or concerns may call Chrysler at (800) 853-1403, or go online at recalls.mopar.com to determine if their vehicles are being recalled.